Inside Monday's meeting at the Queensbridge Houses about a possible NYCHA rent strike. 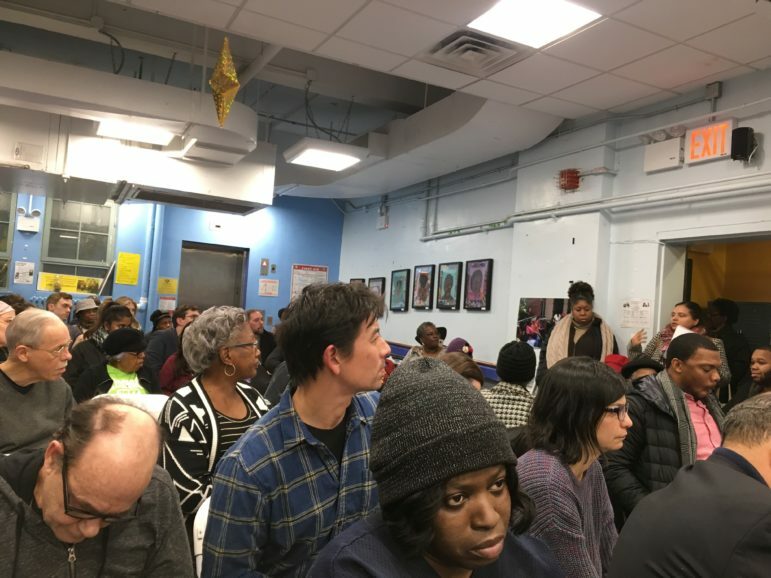 Dozens of NYCHA residents and housing advocates gathered at the Jacob Riis Settlement Center in Queensbridge Houses on Monday night to discuss the beginnings of a plan for a NYCHA rent strike and the impact of Amazon on public housing residents. The Justice for All Coalition hosted the event to discuss the possible rent strike and distribute a survey to NYCHA residents about problematic living conditions such as mold, delayed or nonexistent repairs, rodent infestations, and a lack of heat or hot water. Sylvia White, chairperson at the Justice For All Coalition, said the rent strike–if it occurs–would address some of the main issues that many tenants across NYCHA housing complexes face on a daily basis. For now, the strike is in its planning stages. In 2013, residents at NYCHA’s Lexington Houses in East Harlem threatened the city with a rent strike after more than two weeks of no gas throughout the 112-unit, 14-story tower impacting about 400 people, the New York Daily News reported. After the announcement of the rent strike, NYCHA made repairs twenty-four hours later. She said the list of worries for residents includes the private development of public-housing land through the NYCHA NextGen plan, the possibility of a federal monitor over NYCHA housing and Amazon’s plan to build a headquarters at a Long Island City site neighboring Queensbridge Houses, the largest public-housing complex in the country. At the meeting, tenants spoke about much-needed repairs in their apartments. When one mentioned mold, there were shouts of commiseration. Another tenant from Baruch Houses in Manhattan said she had lived with a hole in her kitchen for weeks that allowed vermin and water bugs to infest her apartment. Another senior-citizen tenant said the rent keeps rising but she did not see improvements in her building from light fixtures to elevator issues. The coalition had one lawyer listening carefully while community activists talked about the next steps NYCHA tenants to could take before a rent strike. Some tenants had more questions and some were hesitant about participating in the rent strike but all agreed that repairs were needed across all NYCHA housing. City Councilmember and public advocate candidate Rafael Espinal said he supported the rent strike and had proposed a plan that could help fix the MTA and NYCHA through unused Stock Transfer Tax funds, a tax which has been rebated back to investors for years. Espinal said the Stock Transfer Tax fund is in the billions and could jumpstart the repairs needed for transit and public housing in the city. For some in the room, the huge subsidies awarded to Amazon to entice it to come to LIC indicated misplaced priorities.